The non-credit ESOL program at CCBC offers classes to help adult non-native speakers learn English for community and workplace settings. These courses teach the English language skills needed to succeed in work, school, and everyday life. Explore our classes below and see the ESOL Registration page for registration dates, locations, and times. All students must come to one of the “Walk-in ESOL Placement & Registration Locations” sessions to sign up for any ESOL Beginning and Intermediate classes. You are not registered until you receive a copy of your registration welcome packet at registration. These classes are supported by grant funding from Maryland Department of Labor, Licensing and Regulation (DLLR). Students with an F-1 or J-1 Visa are not eligible for DLLR grant funded classes. Reasonable accommodations for a disability are available upon request. Please call 443.840.3428 to discuss availability of accommodations and testing procedures. Please call at least two weeks in advance. This very low beginning course starts with basic English for life and work. This low beginning course introduces simple English for life and work. This high beginning course improves simple English for life and work. This low intermediate course continues to develop English language skills and introduces civics concepts. This intermediate course continues to develop English language skills and builds on civics concepts. This high intermediate course continues to develop English language skills and extends civics concepts to civic engagement. 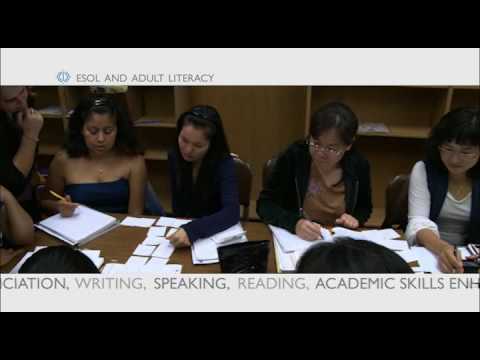 This non-credit course will assist higher level ESOL students move beyond life skills reading and writing. This non-credit course will assist higher level ESOL students with learning strategies to approach academic reading and writing tasks to better prepare them to transition to further education or training. This non-credit course will assist higher level students with English related to career exploration, job search activities and the American work culture. This non-credit course will assist higher level students with English related to various careers in healthcare. 9:00 a.m. - 1:15 p.m.
For more information about these Adult ESOL classes, please contact Caroline Ko at 443.840.3748 or cko@ccbcmd.edu. These non-credit courses are designed for higher level non-native English speakers. The courses are self-select. Students registering for these courses are not required to come to the ESOL registration session to be assessed. Describes CCBC's programs in Grammar, Pronunciation, Writing and more!